Gordon Elliott hosted a media stable visit at his County Meath yard organised by Cheltenham Racecourse and gave updates on his leading contenders for The Festival™ presented by Magners. Elliott has won The Irish Independent Leading Trainer Award at The Festival for the last two years, saddling six winners in 2017 and enjoying a record-equalling eight successes in 2018. His total of 22 wins at The Festival include Don Cossack's victory in the 2016 Magners Cheltenham Gold Cup. The Cullentra handler has emerged as the chief challenger to Willie Mullins for the Jump trainers' championship in Ireland in recent seasons. He has also enjoyed two successes in the Randox Health Grand National at Aintree, courtesy of Silver Birch in 2007 and Tiger Roll in last year's renewal. Elliott has again readied an exciting team for this year's four-day meeting at Cheltenham (March 12-15), boasting established stars such as three-time winner at The Festival Tiger Roll, coupled with talented novice hurdlers and chasers. 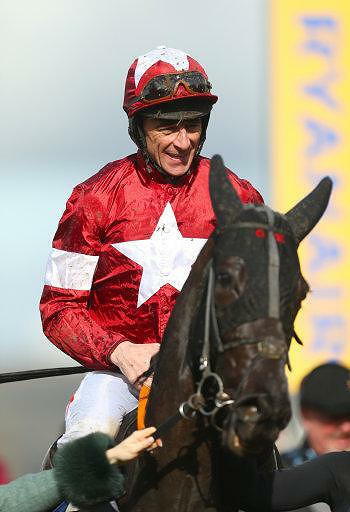 Elliott's battalion is led by the magnificent mare Apple's Jade, who is set to take on dual champion hurdler Buveur D'Air in the feature on day race one of The Festival™ presented by Magners, Champion Day, Tuesday, March 12, the £450,000 G1 Unibet Champion Hurdle. The 10-time G1 winner has enjoyed an excellent season thus far over timber, with four wins in as many starts. Those successes have included a third win in the G1 Hatton's Grace Hurdle over two and a half miles at Fairyhouse on December 2 and an impressive 16-length victory in the G1 Irish Champion Hurdle at Leopardstown when dropped back to two miles last time out on February 2. Successful in the 2017 renewal of the £120,000 G1 OLBG Mares' Hurdle at The Festival, connections had initially targeted the 2019 edition of the two mile and four-furlong race, for which she still holds an entry, with seven-year-old Apple's Jade. However, following her latest victory, Elliott and owner Gigginstown House Stud, decided to re-route the superstar mare to the two-mile hurdling championship. Discussing her preparation, Elliott said: "It's all systems go for the Champion Hurdle with Apple's Jade. "This year, she has just gone from strength to strength and she was impressive when dropping back to two miles last time out. I hope there is more improvement to come and, if she runs to the form that she has run too so far this season, then she will have a big chance in the Champion Hurdle. "I am not saying she is going to win, but if she turns up like she has in her last three runs, then she has a great chance. "It was well publicised that she was in-season at Cheltenham last year (when a non-runner in the three-mile G1 Sun Racing Stayers' Hurdle) and it is something that we will keep an eye on. We knew straight away what was wrong with her and hopefully we will have a clear run with her. "We will just keep doing what we do with Apple's Jade and we will keep checking her. The girls who look after her every day are keeping an eye on her cycle and hopefully everything will be alright with Apple's Jade. "She will not need a whole lot of work before Cheltenham - she is pretty fit and hopefully she just stays fit between now and then. I think giving her another run this year has been important. I would say that is the one mistake we made with her last year that we did not give her another run before Cheltenham. She seems to be thriving on a bit of running. "Apple's Jade does not have to lead in the Champion Hurdle. She was taken on for the lead in the Hatton's Grace and I would arguably say that was her best run of the season. It's Jack Kennedy's job to ride her and he knows what to do. Me, Eddie & Michael [O'Leary, Gigginstown House Stud] were going to go to the Mares' Hurdle with her before Leopardstown, but the manner of her victory the last day meant we thought we should give her a chance. It's the Champion Hurdle and it is the race we all want to win." 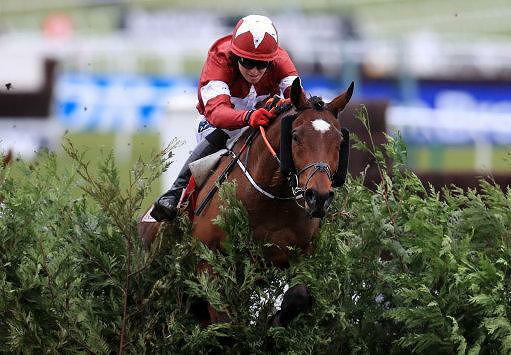 2018 Randox Health Grand National victor Tiger Roll recorded an impressive 25/1 success in Sunday's Boyne Hurdle over two miles and five furlongs at Navan and all roads now lead to Prestbury Park where he will attempt to win a fourth race at The Festival. Successful in the G1 JCB Triumph Hurdle (2014), the G2 National Hunt Chase (2017) and last year's Glenfarclas Cross Country Chase, the Cross Country event (Ladies Day, Wednesday, March 13) is once again the target for the nine-year-old son of Authorized, who heads the market for the three mile and six-furlong event. Discussing the yard favourite, who will also hopefully defend his Grand National crown at Aintree on April 6, Elliott continued: "Tiger Roll has come out of the Boyne Hurdle in very good form. "I couldn't believe how well he won on Sunday and it surprised me. I thought he would finish second or third, but that was a good pipe-opener for the Cross Country Chase which remains the plan and that is where he is going. He showed how good a horse he was on Sunday. "To win a Grand National, three races at the Cheltenham Festival and a Boyne Hurdle, highlights his talent. He is a yard favourite and it was a great performance. "His enthusiasm for the game is unbelievable and he is one of the most versatile horses I've ever had. He might not be the best I've ever trained, but he is certainly the most likeable." The forgotten horse in the lead-up to The Festival has been Samcro, who looked to have the world at his feet when plundering the G1 Ballymore Novices' Hurdle at last year's meeting, but has been a beaten favourite in four starts since, latterly over two miles in the G1 Ryanair Hurdle at Leopardstown in December. Connections revealed that the seven-year-old son of Germany was found to have a lung infection following his latest run and having initially been aimed at the G1 Unibet Champion Hurdle, Elliott said that the £325,000 Sun Racing Stayers Hurdle (St Patrick's Thursday, March 14) over three miles is now a possible target, but the trainer did warn that Samcro may miss Cheltenham and instead take in Aintree or Punchestown. "There's nothing new to report with Samcro. Cheltenham is coming fast enough, but he has the option to go there for the Stayers' Hurdle, Aintree and Punchestown. The next 10 days are important and I cannot tell you any more than that. "Samcro looks good, but it is not the be all and end all. If he gets to Cheltenham, he does or he'll go to Aintree or Punchestown or we take the shoes off and we wait to go chasing next season. There is no decision made on where he is going yet. "Samcro had a bad lung infection and it happens from time-to-time with good horses. It's not ideal, but it's not the end of the world. When you have horses like that who lose their form, nine times out of 10 they have a problem. We have identified it and hopefully he will return to his best form. "He didn't do anything for a couple of weeks after his lung infection and a couple of weeks at that stage of the season is crucial for those horses - every day is very important. If he did run at Cheltenham, I would not be taking any chances with him and he would be very fit." The County Meath handler holds a strong hand in the novice hurdling division, headed by the unbeaten Battleoverdoyen, who has impressed in three starts this term, latterly when capturing the G1 Lawlor's Of Naas Novice Hurdle in January and looks set to tackle the £125,000 G1 Ballymore Novices' Hurdle (2m 5f), the opening race of Ladies Day, Wednesday, March 13, along with Galvin, who has won all five of his starts under Rules. "Battleoverdoyen is in good form", revealed Elliott. "I didn't run him at Leopardstown at the Dublin Racing Festival as he had three quick runs and I wanted to give him a break. "He jumps very well and I've been pleased with his work at home - I think the Ballymore will suit him. He might lack a bit of experience, but timing wise, I think we've made the right decision to give him some time off and go straight to Cheltenham. I think Galvin is another horse who could run in the Ballymore." Commander Of Fleet has tasted defeat just once under Rules and ran on strongly to plunder a G1 novice hurdle over two miles and six furlongs at Leopardstown on February 2. He is set to run in the £125,000 Albert Bartlett Novices' Hurdle (Gold Cup Day, Friday, March 15). "He won a G1 nicely at Leopardstown the last day", commented Elliott. "Three miles will suit him in the Albert Bartlett and he can take his time early and hunt away. He is a nice horse, but I suppose the one negative with him is that he does lack a bit of experience, having had just three runs over hurdles, so we might try and get a school into him before The Festival." Delta Work is unbeaten over fences following three excellent victories this season. Two of those successes have come at G1 level, with the six-year-old son of Network defeating subsequent G1 scorer Le Richebourg in the Drinmore Novice Chase at Fairyhouse in December, before taking the step up to three miles in his stride when recording a facile eight-length victory in the Neville Hotels Novice Chase at Leopardstown later the same month. He looks set to take on the Nicky Henderson-trained Santini in the £175,000 G1 RSA Insurance Novices' Chase (Wednesday, March 13). Elliott said: "Delta Work is very well. I did not run him at the Dublin Racing Festival as I just feared the ground was a bit too quick for him. He has plenty of experience over fences with three runs under his belt and two G1 wins to his name. I thought I had everything to lose and nothing to gain by running him." A wealth of talent also exists in the bumper division for the Cullentra trainer, in which the Cheveley Park Stud-owned Envoi Allen looks set to be the stable's chief hope in the £75,000 G1 Weatherbys Champion Bumper (Wednesday, March 13). The five-year-old son of Muthathir is unbeaten in three starts for Elliott and captured a G2 event at Leopardstown on February 2 - his latest run. Detailing his team for the two-mile event National Hunt flat race, Elliott remarked: "Envoi Allen runs in the bumper. "He just does what he has to do, everything was against him last time with the track and the ground and more of a galloping track will suit him. Envoi Allen is a nice horse, but is one for the future and is hopefully an exciting three-mile chaser in time. "I've probably had speedier horses than him in bumpers, but you won't see him at his best until stepping up to three miles. I will probably run four in the bumper with Thatsy, Daylight Katie and Abacadabras, who ran out in the race at Leopardstown which Envoi Allen won, also going there." Shattered Love landed the G1 JLT Novices' Chase at last year's Festival and she is set to run in Jump racing's Blue Riband event, the £625,000 Magners Gold Cup (Friday, March 15). "Shattered Love goes for the Gold Cup", said Elliott. "She came back with sore shins last time and the ground was quick enough for her that day. She has a few bits to do, but all being well the Gold Cup is the aim. "We are going into the unknown in terms of trip with her and that is a worry with every horse, but if she turns up in the same form as she did in the John Durkan, then she should have a great each-way chance. "It's a positive that she has won at The Festival and she is a good form. I think she could finish in the first four or five, but she is no Don Cossack [Elliott's 2016 Magners Cheltenham Gold Cup winner]. She also has a nice weight for the Grand National so we will consider that." The Storyteller : "He will probably run in the Ryanair Chase. He would need a lot of things to go his way to win it, but I think we are leaning towards that race. The way he is ridden, he could have a squeak of getting into a place in the Ryanair. A better race would suit him than the Irish Gold Cup last year as that was a messy race." Vision D'Honneur (Sky Bet Supreme Novices' Hurdle): "I was disappointed when he got beat at Limerick, but did it well at Punchestown last time. The plan is to go straight to the Supreme with him." Felix Desjy (Sky Bet Supreme Novices' Hurdle): "We dropped him in at Limerick, but he is just a relentless galloper and he did it well at Punchestown last time too. He also runs in the Supreme. We would be happy to make the running with him in a Supreme as he just wants to go a good end-to-end gallop. I am looking forward to going chasing with him over two miles next year. Mengli Khan (JLT Novices' Chase): "I'm thinking about stepping him up in trip for the JLT. I'm disappointed with him as he is just not having a cut at the fences and sometimes Flat-bred horses can do that. It's not concrete, but the JLT is something we are thinking about. Hardline (Racing Post Arkle Novices' Chase): "I'm thinking about stepping Hardline back down in trip. He won over an extended two miles and three furlongs at Limerick. I know Getabird made a mistake that day and I'm not saying he was going to beat him, but he also won a G3 over slightly shorter (2m 1f) at Navan the time before so stepping him back down in trip might not be an issue. "I'm not saying we will beat the favourite for the race, Le Richebourg, as he looks the best in Ireland this season, but the Arkle is on our minds. Hardline ran well last time after being slightly slow at a couple of fences. He made up good ground between the second-last fence and last before getting tired, so I think he will have a good each-way chance in the Arkle." Elliott also confirmed engagements for: Defi Blue & Dinons (Albert Bartlett Novices' Hurdle), Dallas Des Pictons, Cartwright & Flawless Escape (Martin Pipe Conditional Jockeys' Handicap Hurdle). Detailing the size of his Cheltenham team, Elliott remarked: "I would say we'll have around 50 runners overall give or take a couple here and there. "I think we had around 40 runners last year, so we'll probably have been eight to 10 more runners this time around. To try and beat the eight winners we had last year is going to be very hard, but numbers and quality-wise, at this stage I would say we have a very nice bunch. "Going to Cheltenham, I'm happy to get one winner and anything else is a bonus. It is a place where you have to be realistic. It is the Olympics and everyone is trying. If you train winners at Cheltenham, people remember you. Last year was unbelievable for all of us and we need to try and keep improving."